I’ve been going to several homes lately for private dog training lessons for inter-pack dog aggression resulting in dog fights. Dog owners often add new dogs to their homes around the holidays, and it’s not always a match made in heaven. Aggression can start at any time, and for any reason. Adding a new dog to the pack can certainly shake things up, but conflict can also arise between dogs that have lived together for years. Perhaps the warning signs were not recognized, or something changed in the relationship between the dogs. In some houses, the pack was set up in such a way that fights happened over resources. In the majority of my cases, some kind of human mismanagement ultimately led to the first fight. Once the first fight happens, more fights are sure to come, and you will need help from a Wags & Wiggles certified dog trainer. Some owners think that dogs will be less lonely if they share a crate. Perhaps one dog has separation anxiety, or maybe space in the house is limited. Sometimes, puppies get adopted or purchased together and the breeder sends them home in one shared crate, so the owners just keep it that way. It’s also typical for owners to put both dogs together in one crate in the car due to space. Sharing a crate is never a good idea. Puppies may start to play in this tiny space. Dogs need space to diffuse rough play when it gets too intense. Obviously, that can’t be done in crate, so the rough play can lead to dog fights. The closeness reminds me of long car rides trapped in the backseat with my siblings. Luckily we were all seat-belted in because surely, after a few hundred miles, a brawl was going to break out in the backseat! While it can be cute to see dogs piled on top of each other in one bed, at some point, due to age, illness, or just lowered tolerance, some dog won’t be happy with this arrangement. It is much safer and less work to teach your dogs to hang out on their individual beds. Using tie-downs can help establish this new rule at first. The number one thing humans allow their dogs to do that can lead to dog fights is grabbing toys or bones from other dogs. Dogs have different strategies to steal items from other dogs. Some lay in wait, staring down the other dog until that dog drops the item. Some chase the other dog down, licking their mouth until they drop the item. In other cases, the human plays fetch with one toy and multiple dogs creating competition and strengthening thievery during play. No matter the strategy, any sort of thievery should be stopped by the human. This can be done by simply adding so many toys or bones to the environment that there is always another item available to the dog that is looking around. If there are three dogs, there should probably be 6 or 7 toys or bones available. If you have a dog that has the “grass is greener on the other side” syndrome, you will need to take more action. This dog will always want what the other dog has no matter how many things you put out. You will need leashes, tie downs, strong responses to cues like “Leave It,” and strict supervision to break this nasty habit. During fetch, teach your dog to fetch “their own toy” and leave the other dog and the other toy alone. This will involve leashes and strategic training sessions. When the new dog arrived, there may have been joy and happiness for all. Wrestling and playing can be part of the norm. If left unchecked during adolescence, wrestling matches can go on for longer and become more serious. This can spill over into skirmishes or all-out dog fights. Limiting the time of the play can prevent dog fights. Break up longer play sessions with some positive-reinforcement based training or puzzle time. Below are two videos of normal dog play that, if let go on too long, could lead to dog fights. These two dogs are young, one dog is a year old and the other is only 6 months, and both dogs are male and intact. There are several factors when judging whether a play session should be interrupted. If the amount of grabbing and biting is accelerating, break it up. If the growls, barks, and whines intensify, give them a break. In moderation, this game is fine. If it goes on for a long time, or you can’t get them to drop the toy, it’s time to take the toy away. If allowed, these two dogs would play literally for an hour straight. That is a huge red flag for two youngsters who may have issues as mature. We allow them to play for short periods of time, then practice recalls, fetch, or separate in crates with individual bones or puzzles. If other dogs in the pack start barking or sniping when the dogs are playing, it could be a sign that the play has gotten too serious. Time for a break! This play season was interrupted due to the growling intensifying. Other pack members were starting to police them (you can hear the barking in the background), and they have been playing tug for about 10 minutes straight. This play session would have been interrupted if it had not stopped on its own. 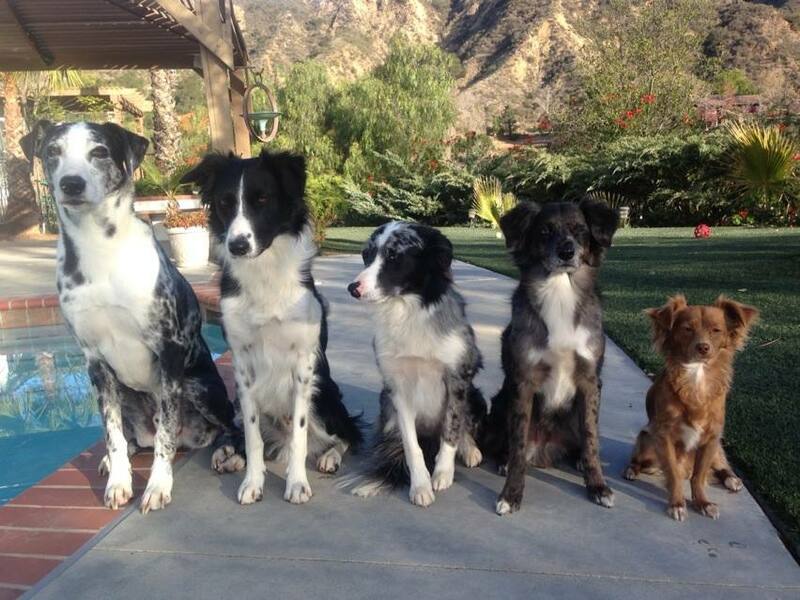 The Aussie was on top of the Border Collie for a long time. The biting was intensifying. You can see that the Border Collie had a long shake-off after the play stopped. That signals he probably wasn’t having fun anymore. Barriers are often a location where dog fights happen. Dogs can get excited, frustrated, and competitive for attention, and these emotions are kindling for a major fight. Owners need a solid management plan for the arrivals and departures of humans. Having several dogs jumping or swarming the door when people come in is not a good plan. You can use baby gates or crates to separate dogs. Humans should not give any attention or pets to barking, jumping, or overexcited dogs. If you can come in, ignore the dogs, get settled, and THEN go greet the pack, you can reduce the likelihood of a dog fight. If one or more of the dogs in your house is reactive on walks or fence fights with neighbor dogs, you will most likely see some aggression within your pack. Underlying anxiety or reactivity issues will plant seeds of negative emotions in your pack. If your dogs are leash reactive and get so worked up that they start barking or lunging at each other, the likelihood of a fight in your home after a walk is much greater. Walk the dogs separately if needed until you hire a dog trainer to help you resolve the anxiety and reactivity problems. Most owners with multiple dogs have a method of making sure one dog doesn’t steal the other dog’s food. Most problems develop as the supervision level becomes lax over time and one dog starts bullying the other because they finished first. Using individual crates to feed is the safest way to prevent dog fights in the house. Some packs can tolerate what I call the “Rinse Cycle.” Once everyone is done, then all the dogs switch places and lick each other’s bowls. However, in packs where dog fights have already happened, this should be avoided. Many dog owners have false beliefs about who is the dominant dog. Usually, they believe the most assertive dog is the dominant dog. They make sure that dog gets everything first and they feel that will prevent fights. Each person I ask has a different definition of dominance, so deciding who is dominant usually isn’t an exact science. The problem is that these false beliefs about dominance leads owners to reinforce pushy, obnoxious behavior versus rewarding patient, calm behavior. That pushy behavior leads to dog fights in the home. So instead of worrying about who is dominant, watch for who is calm and reward that dog first! If you need additional help preventing dog fights in your home, please reach out to a certified dog trainer! Previous PostCan I Train My Dog Online?